One of the most popular ways to achieve a wide color gamut LCD display is with narrow-band red and green phosphors deposited directly on top of blue LEDs to create the LED backlight unit. Now, a new company, Lumenari, has developed a new and narrower green phosphor that can expand the LCD display’s color gamut 10-20% over the current phosphor-converted LED-backlit LCD displays. We recently spoke with Robert Nordsell, Co-founder and CEO of the company. He explained that their green phosphor material, called Emerald, is actually tunable from 505 to 545 nm, but the feedback they have received so far from display makers is that a peak at around 525 nm is the most optimal. Full width half maximum (FWHM) bandwidth varies from 32 to 45 nm over this range but exhibits a narrow 38 nm at 525 nm. Nordsell explained that 525 nm is a good choice as it offers outstanding coverage of the cyan and green, which are not covered as well by the DCI-P3 gamut. 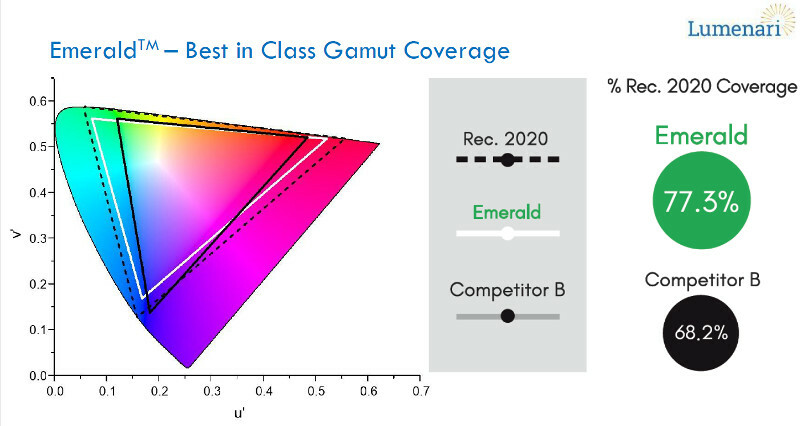 The figure below shows the coverage using Emerald vs. an unnamed competitor. Note that their primaries are well-aligned with the BT.2020 primaries. “TV makers are focused on achieving DCI-P3 coverage today, but they want to push toward Rec. 2020 soon,” said Nordsell. “The maximum of the photopic response curve is actually 555 nm, so our 525 nm Emerald phosphor is actually further away from the photopic maximum than a 540 nm phosphor, therefore making Emerald less bright in an LED package. However, because Emerald’s emission peak is aligned more closely with the transmission maximum of the display’s color filters, the display surface luminance exhibits a 5% relative increase in brightness compared to the current state of the art (SOTA) 535 nm green phosphor. However, at Emerald’s current quantum yield, the relative surface luminance is 85% of the SOTA. We expect that brightness gap to close as we improve quantum yield, but may not close the gap entirely since the emission peak is farther away from the photopic maximum,” concluded Nordsell. Another key advantage of Emerald material: constant quantum yield (65%) across the wavelength range from 525 to 545 nm. The competitive green phosphor, B-SiAlON, has a peak efficiency at 545 nm but drops to about half that value at 529 (which is why it is not used at that wavelength). Lumenari is also working on a narrow-band red phosphor, but commercializing green is the main focus today. As a result, their display customers are pairing the green phosphor with the narrow-band KSF phosphor from GE. Some have complained that the KSF red has a slow decay time which can lead to a red afterglow on faster moving objects. Lumenari’s green phosphor is very fast in decay time – on the order of 1,000s of nanoseconds. Nordsell noted that this issue with KSF is handled by blending it with a more traditional, wider-band red phosphor. So where are they in the commercialization process, we asked? “We are focused on achieving LED reliability targets through two major efforts: encapsulating Emerald into a thin film solution, and particle coating to create a powder that can be mixed in silicone and deposited directly on top of the blue LED,” said Nordsell. Since the particle coating solution will take a bit longer, the company is trying to commercialize the film-based solution first. Here, the issue is protecting the phosphor particles from moisture, so they do not degrade. However, encapsulation sheets for OLED and quantum dot materials to block moisture and oxygen have been developed, so Nordsell sees this more as an engineering, not a scientific challenge. They are starting to engage with outside partners now and expect to demonstrate a proof-of-concept in Q4’18. Time will then be needed for these potential partners to test, validate, certify and qualify the process for mass production. That could take up to a year. Lumenari is still a small company with 12 employees, but it did just raise $3M in a Series A round of funding. Led by TJ Rodgers, Jeremy Blank, and Revolution’s “Rise of the Rest” Seed Fund, the company will use the capital to complete an advanced lab-scale manufacturing line for its Emerald technology, establish testing partnerships with packaged LED suppliers and pass initial qualification testing. Interestingly, Lumenari moved from Silicon Valley to Lexington, KY choosing to scale outside of the coastal tech hubs. Expanding the color gamut beyond P3 will start to play into display maker’s roadmaps soon and Lumenari looks to have a green solution ready to meet the challenge. We will be following their progress and will report back from time to time.